“You’re doing a lot of things so well with these. The composition for them is really great, how all of the lines from the onion kind of lead your eye further back in. And also the use of the material. 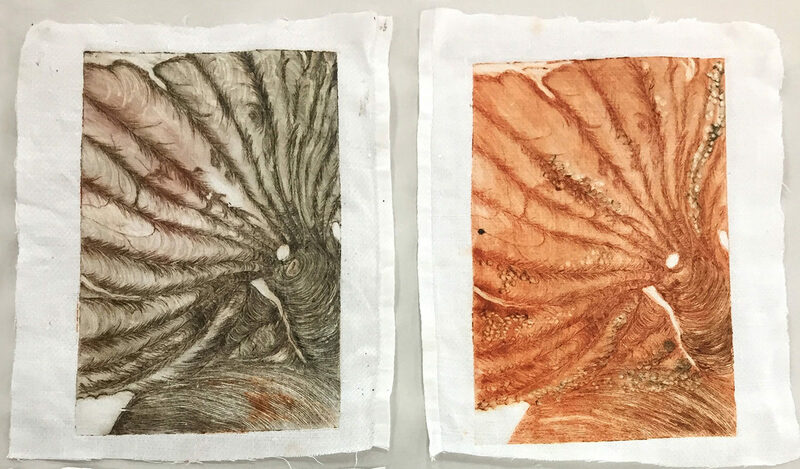 The printing, the intaglio print on the fabric is a really nice way to execute the kind of things that drew you to the subject matter of the onion. In your concept you’re talking about how you want to relate it between human anatomy and that’s reading really well. What it’s reading so well is your concept about the layers and how things can change once you go deeper. I’m thinking the best way to do that might be to make a further series of these because it’s working so well with the multiple different colors of prints. What if you unraveled the onion piece by piece and create a series of those images? But I also like how they kind of look like landscapes to. 4 responses on "Riannon Davies"
Wonderful job creating something completely new from your original subject matter ! I really enjoy the earthy tones you’ve chosen to use, and the beautiful line work. Printing on fabric is really interesting, and adds another layer to this piece. I wonder what would happen if the piece of fabric you chose was smaller than the size of the print, therefore forcing the image to bleed off of the bounds of the fabric. I thought of this because there is an interesting contrast between the harsh edges of the image, the white border, and the frayed edges of the fabric. Playing around with different fabrics and how they play a larger role in the presentation of the piece could be a really interesting next step for you! I think you would really like the work of Erika Radich! 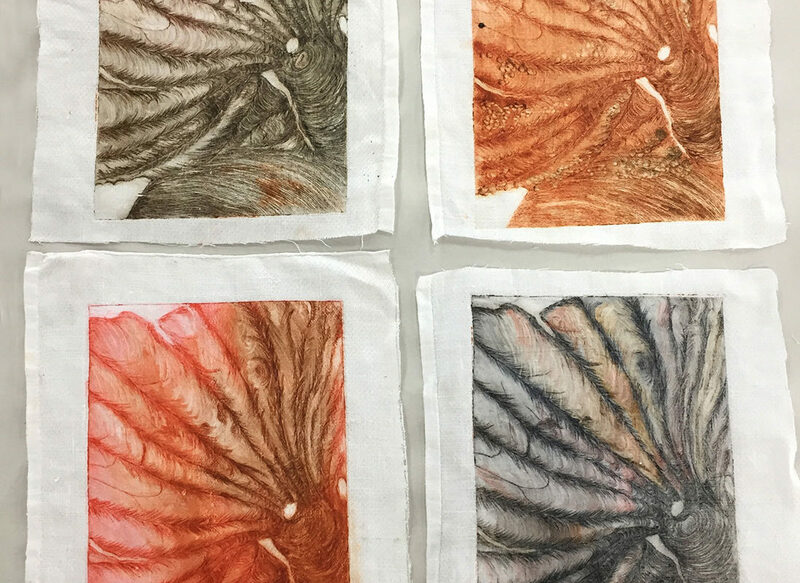 She uses printmaking techniques to describe patterns and formations in the natural world. And she uses natural pigments too! You really have an eye for beautiful and complex color palettes. The four prints together have a lovely color harmony. I also think abstracting the onion was a great idea. It reminds me of undersea creatures, sand dunes, and skin all at the same time. You might want to try printing on some translucent materials. 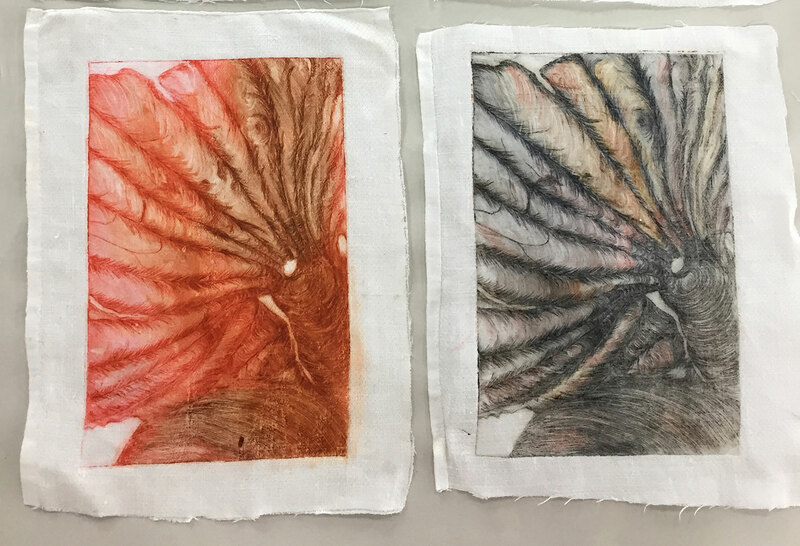 Lace, silk, or chiffon might be really fun to print on, and some of these materials mimic the texture and consistency of onion layers, and of skin. I would also want to see different compositions of the onion skins, maybe zoomed in or zoomed out. When I see your work, I think a little of Cynthia Lin’s zoomed in pencil reproductions of skin. I could see your work going in a similar direction! I think you’ve done a terrific job of transforming your original subject matter, an onion, into something completely different. So often I see people literally copying their subject, and here I really get a sense of your artistic interpretation the way you’ve transformed the onion almost into a landscape. The ambiguity of the scale also keeps me engaged, is this piece a gigantic landscape of a planet, or is it a form that is under a microscope? The image sustains my attention and makes me curious. The line work is beautifully done, I wonder if you could experiment with creating another level of very, very, light subtle lines so that there is more variety in the line work. Right now the line work is very fluid and bold, but could be enhanced by softer marks that are almost not there. 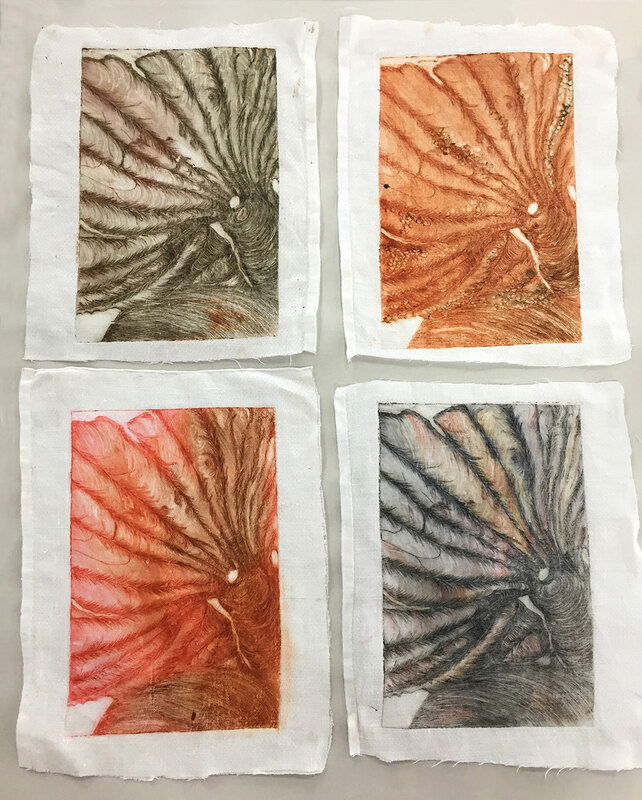 Nice work, love that you are printing on fabric and experimenting with a wide range of colors! 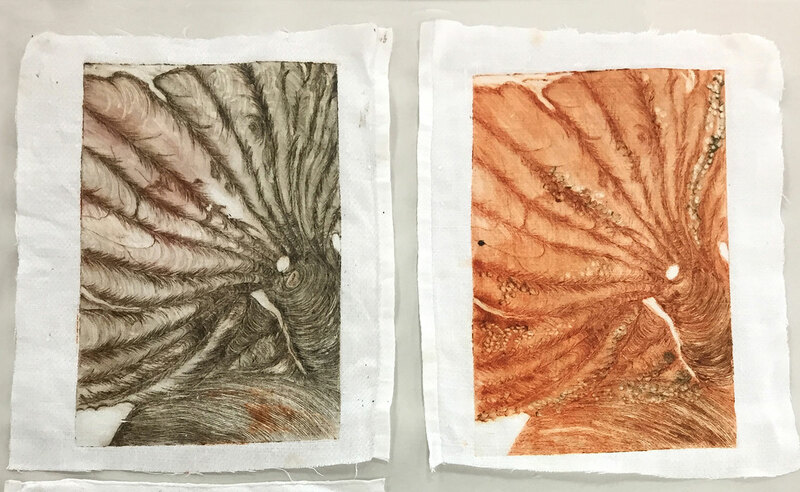 I’m really impressed by the subtle range of color you’ve achieved in these prints, as well as your line work within the engraving, itself. 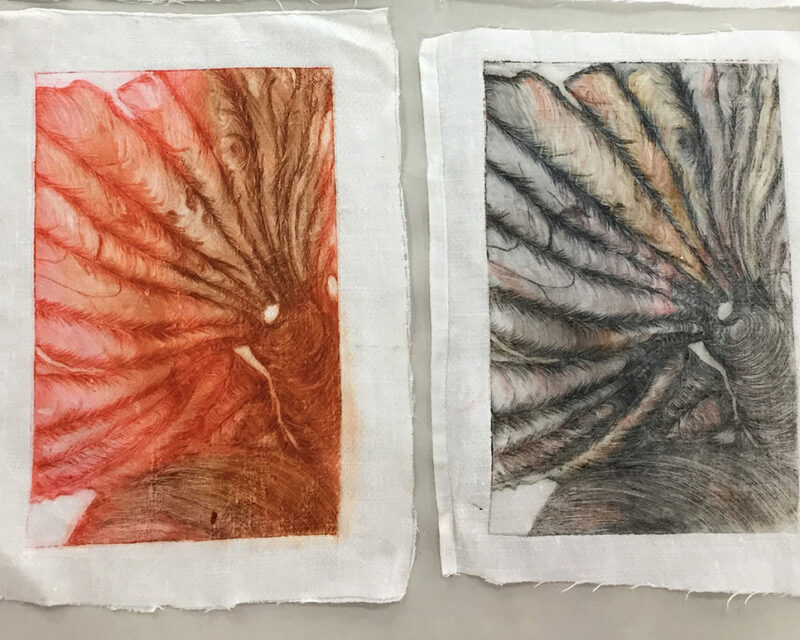 It’ll be interesting to see where you push this series in future pieces… I would suggest putting more thought into how you present this work; especially considering your decision to print on fabric. 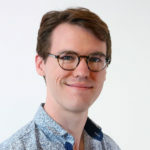 There’s a lot of opportunity here to further explore the kind of translucency and layering you refer to in your Artist Statement. Most people would probably never consider the onion a glamorous choice for a still life, but this work has shown me that it’s actually the perfect subject for a study in nuance! You have a real eye for composition and abstraction. Great work.